They say that all good things come to end and I'd like to add, "for now". We trekked on over from the hotel to my Grandmother's house to hang out until noon, when we would have to depart for the bus to Narita airport. 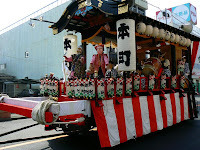 The procession for the Matsuri started up again with the kids leading the way. I took my pal, Koro, for a walk. My cousin and her family came and brought me sake to take home. 為をありがとう! My aunt made sure that we were thoroughly stuffed with food and I sat next to my Grandmother who will be 100 next year. Grandmother goes to elderly daycare and when you reach 100 years old, they throw you a fairly extravagant birthday party and you receive the gift of 30,000 yen ($300). When asked what she wants to do with $300, she quickly replied, "I want a heaping bowl of shrimp tempura!" ?!?!?! Grandma, shouldn't you be eating a little healthier than a heaping bowl of tempura? Oh well... She can eat whateeeeeeeeeeeever she wants. =) I promised her I would be back next year so that we could once again share laughs. Until next year!